© 2016 Heba El-Hakim – All Rights Reserved. Unauthorized use and/or duplication of this material without express and written permission from this blog’s author and/or owner is strictly prohibited. Images, excerpts and links may be used, provided that full and clear credit is given to Heba El-Hakim and this blog at www.hebaelhakim.com with appropriate and specific direction to the original content. Vetiver is a deeply grounding oil helping us become more rooted in life.When life scatters our energy and causes us to feel torn between different priorities, people and activities, Vetiver can bring us back down to earth and ground us in the physical world. It’s often used to promote restful sleep (with possibility of very vivid dreams!) but equally helpful when you feel restless in life. Vetiver helps you find a comfortable footing in your own role and chosen path. It can help you relax and feel more connected to earth and with what you think and feel. In this way, Vetiver is very supportive in doing self-awareness work to help uncover the root of our emotional issues. 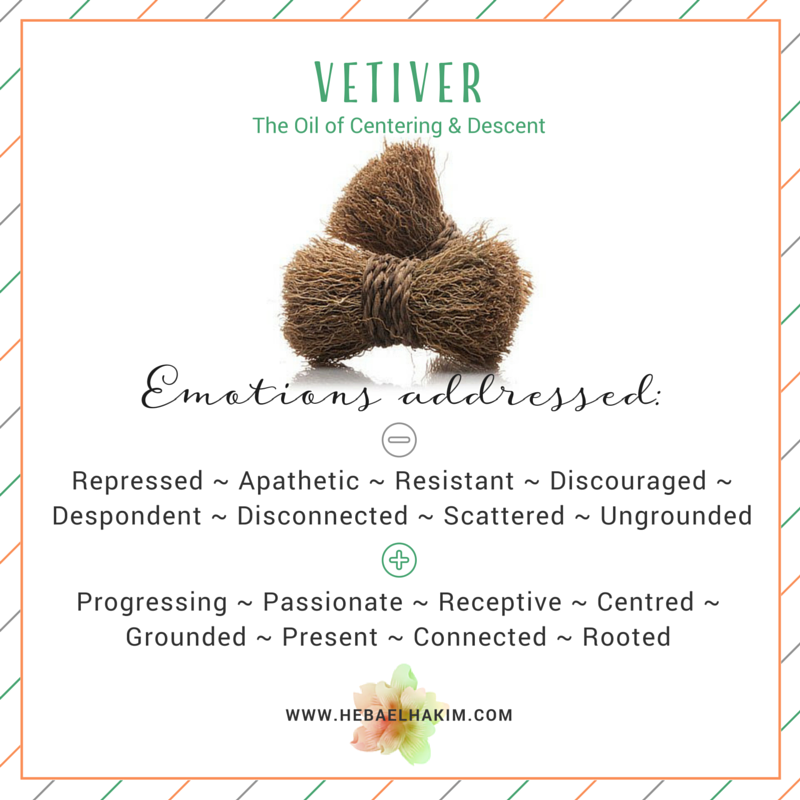 Vetiver also can be very supportive for those who lack motivation, struggle with apathy or a feeling of “why bother” and those who feel disconnected. It instills a sense of deep and meaningful connection with our bodies and centers us in our Self guiding us inward to the root of our emotional pains. Vetiver will challenge your need to escape these pains and will support you in becoming aware of them first and then addressing them second. Relief will come from traveling within to meet your core not from avoidance which doesn’t serve you anymore. It is a big player in helping you become conscious of the unconscious so if you don’t want to become consciously aware of your unconscious desires and issues then you may want to stay clear of this one because Vetiver will not allow you to quit. It acts like a catalyst for your emotions and brings them up to the surface after which you feel more grounded, calm and balanced. It is a downward journey into the Self but one that will uncover deep facets of your being and bring you to light and recovery. Vetiver affects the heart chakra which aligns the root chakra and it promotes the balancing of the central nervous system which doesn’t have a specific chakra. Vetiver blends well with Clary Sage, Lavender, Rose, Sandalwood, Ylang Ylang. Depending on your uses for this oil, substitutes may include: Frankincense, Lavender. Use with caution during pregnancy, particularly in the first trimester. Always test for skin sensitivity prior to widespread use and use on the feet when possible. Excessive use of any oil can lead to skin sensitisation. Keep out of eyes, ears, or nose. Not all oils are created equal, so test brands carefully, and never use an oil in a way not recommended by its maker. Sign up for my newsletter and be notified of new blog posts, upcoming webinars and e-courses, special offers, and receive my FREE resources!